Female black belt light-feather weight sensation and Ciao Terra prodigy, Kristina Barlaan lit up her division like a rocket in the sky! In her first year as a black belt, she took 2nd in both the Pans and IBJJF World Championships. DIGITSU is proud to present her first ever instructional series. 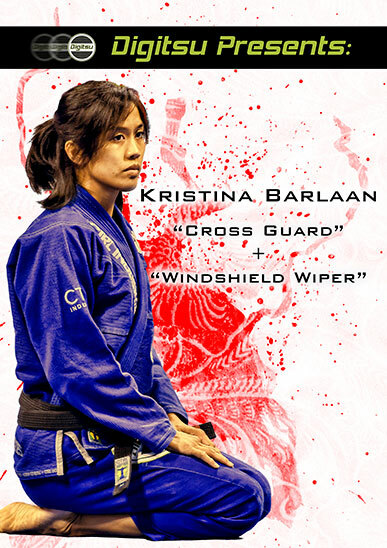 In these lessons, Kristina walks you through two of her most successful positions --- Windshield Wiper and Cross Guard. These two positions are a perfect complement to each other. Both aggressive and submission oriented. Add these techniques to your game today! Do NOT sleep on this, folks. There's a lot of valuable content, and it's all very practical and very devastating. Two great series that you can spend months and months chewing on, and will keep you giggling in training while your partners feel helpless and humiliated. Kristina is highly detail-oriented and goes through each step methodically and comprehensively, having you understand both the HOW and the WHY. Plus she's easier to look at than all other gnarled orks you might find. Highly recommended, great stuff, great price, totally worth it.